Virginia Beach makes a great destination for a Valentine’s Day retreat. A stroll along the waterfront at sundown gives an entrancing view of the kaleidoscope of colors of the sunset. Likewise, a walk along the beach at night is rewarding because of the moonlight shimmering on the ocean and stars sparking against the black velvet of the sky. 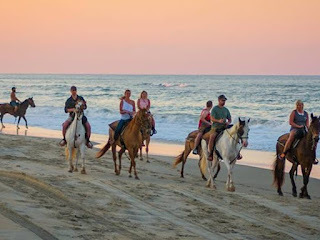 Another option is to go on a guided horseback ride through the surf, which is on the bucket list of many visitors to the city. And what could be more romantic! Virginia Beach Horseback offers one-hour tours on the weekends, as well as on various other days during winter. Never been on a horse before? That isn’t a problem because no experience is required. Before starting, the guide will explain how to handle your horse. The fee for two riders is $80. If you like, you may choose to have a professional photo taken for an additional fee. The enterprise is located on 26th Street and Atlantic Avenue. A further idea for a Valentine’s Day celebration is to have a picnic by the ocean or in one of the city parks. Just don a warm jacket, and pick up some of your favorite takeout food and a box of chocolates.